When I was a child, in elementary school, we would go on a class trip to the Museum of the American Indian just about every year. This was not a trip to Washington DC, where the museum is today. It wasn’t a trip to the financial district either. It was a trip to a collection of beautiful beaux-arts buildings called Audubon Terrace. While the museum has moved to both the financial district and Washington DC, Audubon Terrace is still here and still beautiful. Audubon Terrace is named after John James Audubon because it is built on land that once was his family estate. John James Audubon is best known for his paintings of the birds of America, which he produced and published in 1827. Audubon was born in Haiti, and moved to New York in 1803. Throughout his life he move around the country and its territories. But for the last 10 years he lived on an estate he bought along the Hudson River, north of New York City. The 20 acre estate became known as Audubon Park as his widow began to sell off parcels for development. In 1907 the land was bought up by Archer M. Huntington, heir to the Southern Pacific Railroad fortune. He developed this parcel to be the home of the Hispanic Society of America which he had founded in 1904. The Hispanic Society of America was the first building to open and it is the heart and center of Audubon Terrace. The building opened in 1908. It is dedicated to the art and literature of Spain, Portugal, Latin America and the Philippines through the early 20th century. It started as Archer Huntington’s collection, but it has grown. The collection includes works by Goya and El Greco, but to me the highlight is the Sorolla Room. 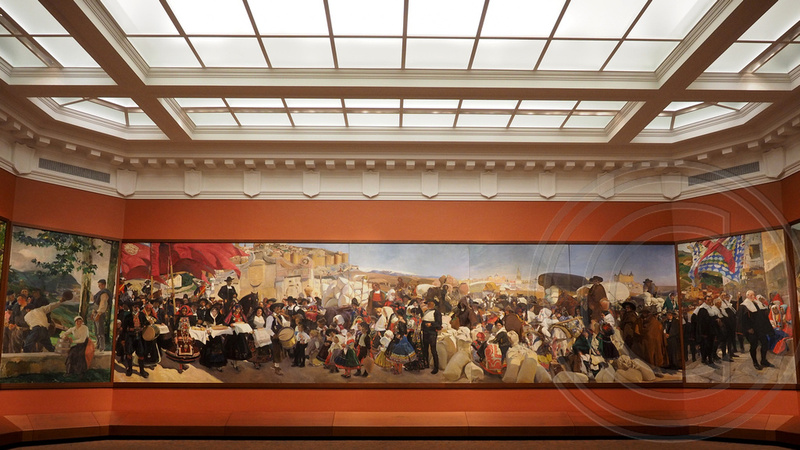 This wing of the museum contains 14 paintings by Joaquín Sorolla y Bastida entitled Visions of Spain. These massive and beautiful paintings represent different areas and cultures in Spain. Over the next 20 years more buildings were added to Audubon Terrace. 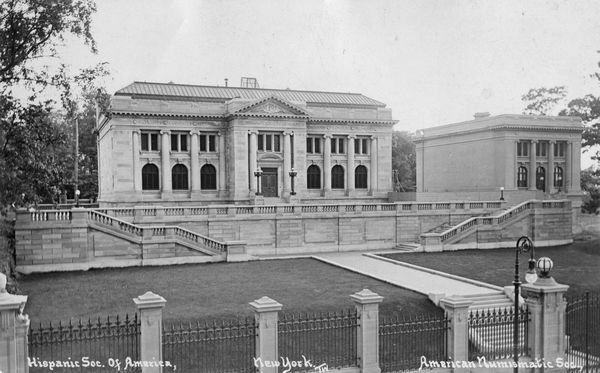 The American Numismatic Society opened in 1908, The American Geographical Society in 1911, The Church of Our Lady of Esperanza in 1912, the Museum of the American Indian in 1922 and finally the American Academy of Arts and Letters and National Institute of Arts and Letters in 1923. As I mentioned earlier, The Museum of the American Indian was a regular destination of for class trips. The museum began as the collection of George Gustav Heye, who started to gather Indian artifacts while working as a railroad superintendent in Arizona. As he continued these activities he needed more and more space, until he opened his museum at Audubon Terrace in 1922. In 1989 the Smithsonian Institute absorbed Heye’s Museum if the American Indian, and the Audubon Terrace building was closed on 1994 when the Smithsonian moved it to the Hamilton Customs House in Lower Manhattan. Today the part of the museum is still located in New York, but most of it is now in its new home on the mall in Washington DC. There is a collection of statues in the plaza of terrace. These works were created by Anna Hyatt Huntington, wife of Archer Huntington and one of New York most prominent sculptors of the era. The centerpiece is a depiction of El Cid, surrounded by four Castillan warriors. This statue is the original of which there are editions in Seville, San Francisco, San Diego and Buenos Aires. Anna Huntington also constructed the bas relief of Don Quixote nearby. These excellent examples of Beaux Arts and neo-classical architecture along with the works on display at the Hispanic Society are well worth the trip up to 156th street. When you are there make sure to walk along Broadway and enjoy one of Mom & Pop Dominican restaurants for a down home lunch. Getting There – Take the #1 train to the 157th street stop. Walk one block south along Broadway. This building complex is an unexpected jewel nestled in a vibrant working class community in Harlem. Walking through the galleries is like walking into a totally different world. Everyone should take a ride up to see it. I appreciate your article! I grew up right down the block, but never knew the history of the complex or visited any other than the building which used to house the American Indian Museum. What kind of condition are the buildings in?Are they maintained privately or by the city? Do they get much traffic?